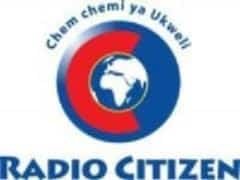 Radio Citizen Kenya Live Streaming Online.Listen over 50 Kenya FM Radio Stations Live Online.Enjoy Live Stream of Kenya FM Radio stations Online. This is Kenya’s biggest radio station in kenya. It targets common man who form a greater part of the country’s population. It has the most transmission sites for an FM station in Kenya giving it the deepest penetration countrywide. Frequencies include Nairobi 106.7 FM, Nakuru 100.5 FM, Kisumu 97.6 , Mombasa 97.3, Nyeri 104.3, Meru 94.3 , Chuka 93.2 , Eldoret 90.4 , Garissa 95.7 , Kitui 89.9.The station offers news, features, talk shows, games and a distinct selection of the finest African tunes. FM will start playing automatically.you may need to install Adobe Flash player to Listen this Station.Please wait for 30 seconds to listen this Stations(Player loading may take 30 Seconds).If You Face any problems in listening to this station please Click Contact us button we will get back to you as soon as possible.